﻿ Las Tinajas restaurant news. Typical granadine cuisine, andalusian and international. We offers for lovers, next February 14, our updated and romantic VALENTINE'S DAY MENU. Restaurant to home service updated. Great 2018 new year's eve dinner menu updated. We present again our tasting menu for the winter season. From the 8 to 23 November 2018 we organize the XXVII GASTRONOMIC DAYS. This year, there are another three restaurants invited to officiate in our kitchen. Collados Beach Restaurant, from La Manga (Murcia). José María's Restaurant, from Segovia. El Copo Restaurant, from Los Barrios (Cádiz). Winter season groups menus updated. Ready again to offer our visitors the best culinary experience in our beautiful city. WE CLOSE FOR HOLIDAYS FROM JULY 20 TO AUGUST 14 (both included). THEN WE'LL BE BACK TO GIVE YOU AGAIN THE BEST SERVICE. Summer season groups menus updated. Our restaurant offers for lovers, next February 14, our updated and romantic VALENTINE'S DAY MENU. Great 2017 new year's eve dinner menu updated. From the 9 to 24 November 2017 we organize the XXVI GASTRONOMIC DAYS. This year, there are three restaurants invited to officiate in our kitchen. Casa Rufino Restaurant, from Huelva. Ventorrillo El Chato, from Cádiz. WE CLOSE FOR HOLIDAYS FROM JULY 30 TO AUGUST 26 (both included). Great 2016 new year's eve dinner menu updated. From the 10 to 24 November 2016 we organize the XXV GASTRONOMIC DAYS. El Faro Group, from Cádiz. Next November we organize the XXV GASTRONOMIC DAYS. This year will be special for celebrating the 25th anniversary. And the 45th of establishment. After the summer season we return to close on TUESDAYS for staff rest. WE CLOSE FOR HOLIDAYS FROM 6 TO 31 AUGUST (both included). CLOSED SUNDAYS for staff rest. Great 2015 new year's eve dinner menu updated. From the 18 to 27 November 2015 we organize the XXIV GASTRONOMIC DAYS. This year, there are two restaurants invited to officiate in our kitchen. José Maria Restaurant, from Segovia. CLOSED TUESDAYS for staff rest. WE CLOSE FOR HOLIDAYS FROM 7 TO 31 AUGUST (both included). 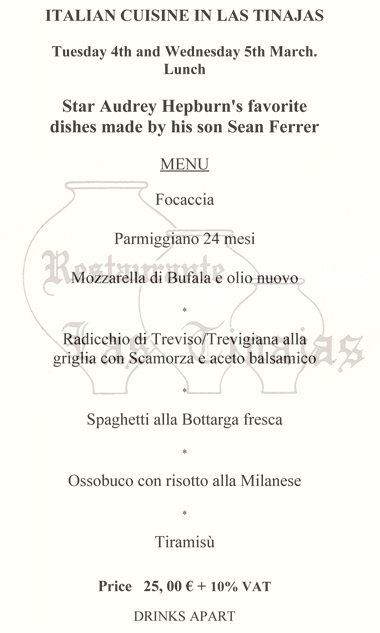 Again we organized a gastronomic days with Sean Ferrer, next Wednesday 4 and Thursday 5 March, a fusion of Italian-Spanish cuisine. Our restaurant offers for lovers, next February 14, our new and romantic VALENTINE'S DAY MENU. Great 2014 new year's eve dinner menu updated. From the 13 to 28 November 2014 we organize the XXIII GASTRONOMIC DAYS coordinated and directed by PABLO AMATE. This year, as always, there are three restaurants invited to officiate in our kitchen. Batiste, from Santa Pola, Alicante. El Copo, from Los Barrios, Cádiz. Juan Moreno, from Vera, Almería. WE CLOSE FOR HOLIDAYS FROM JULY, 28 TO AUGUST, 19 (both included). Mariana Pineda in Las Tinajas. Sit at the table of... Mariana Pineda, in honor of our local historic character. Menus updated for the summer season. Italian Cuisine in Las Tinajas. 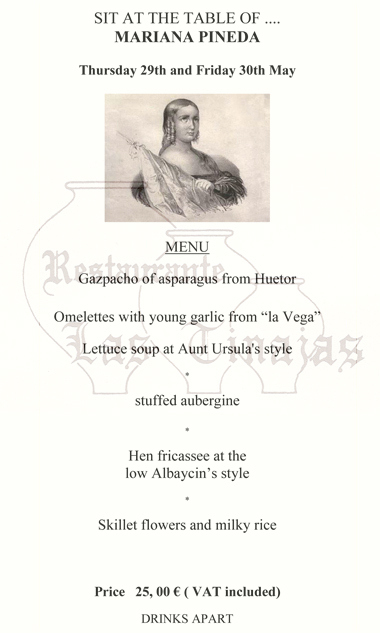 Favorite dishes of Audrey Hepburn, produced by his son Sean Ferrer. Great 2013 new year's eve dinner menu updated. Winter season anticrisis menus updated. From the 8 to 23 November 2013 we organize the XXII GASTRONOMIC DAYS coordinated and directed by PABLO AMATE. Collados beach La Manga, from Murcia. Again ready to offer our visitors the best dining in our unique city. WE CLOSE FOR HOLIDAYS FROM JULY, 21 TO AUGUST, 14. In March 2013 we participated in the contest V GRANADA DE TAPAS with another delicious creation. Nut crusted cod on black bread, caramelized onions and avocado mayonnaise. Reaching the 3rd prize. You can continue enjoying it in our restaurant ... Don't miss it, it's delicious. Presentation of the tapa we created for the fifth edition of the GRANADA DE TAPAS contest. Nut crusted cod on black bread, caramelized onions and avocado mayonnaise. Our restaurant proposed for lovers, last Thursday, February 14, 2013 our romantic VALENTINE'S DAY MENU. Maria Madrid Foundation holded a CHARITY DINNER in our restaurant last Thursday, February 7, 2013 with great public acceptance. A staff group "El Faro" from Cadiz traveled to Granada few days ago to celebrate the XXI gastronomic days at the famed restaurant "Las Tinajas" reaping a great attendance, you could tasted famous dishes like shrimp omelettes, one of favorite dishes by his Majesty Juan Carlos I, who gave a good account of them during his visit to the restaurant at San Felix's street on the occasion of the Summit, anemones and the famous seafood soup "Caldillo de Perro"
The world-renown Independent Consumer's Guide to Fine Wine gives 93 points to our wine. The "Las Claras" was bottled under the trademark "Las Tinajas" in Andalucia. From the 8 to 23 November 2012 we organized the XXI GASTRONOMIC DAYS coordinated and directed by PABLO AMATE. This year, as always, there was three restaurants invited to officiate in our kitchen. Casa Rufino, from Isla Cristina (Huelva). An institution in fish and tuna. Meson del Cid, from Burgos. Provided the best tradition of Castilian roasts. El Faro, from Cadiz. Bastion of Andalusian cuisine will brought its prestigious recipes. October 11, 2012. In our continuing effort to improve the care we provide to our customers, we release this new website, with more information and services. Appreciate and take into account any contribution, reviews, comments and suggestions. Thank you very much for your feedback. October 4, 2012. We launched our new anticrisis menus. We combine our efforts on getting at minimum price, the best samples of our cuisine. Despite bad situation we can continue to enjoy pieces of gastronomic joy in our beautiful city. September 27, 2012. We update our menus to suit the winter season, adding some new features that we hope will please our customers and friends. 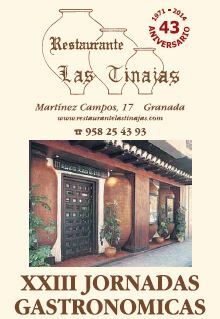 From 8 to 19 March 2012 we participated in the contest IV GRANADA DE TAPAS with our delicious creation. Brik of cheeks in his juice and apple slices on bottom of caramelized onion and currant bouquet. Reaching the 2nd prize.